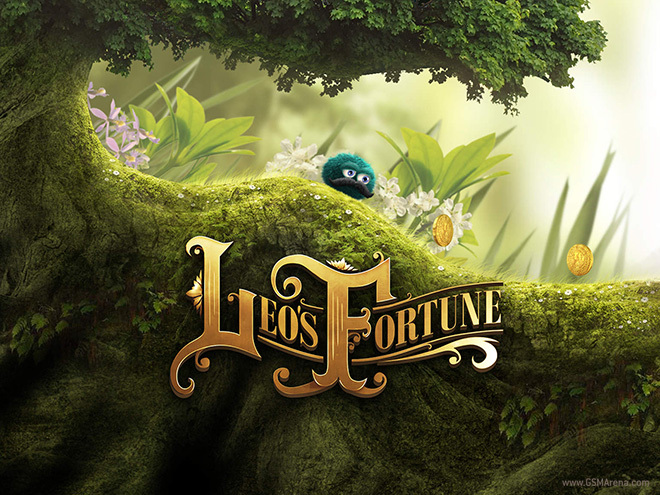 Leo’s Fortune is a 2D platforming game for iOS. It was awarded Editor’s Choice by Apple on the App Store and has won many accolades since it went on sale. 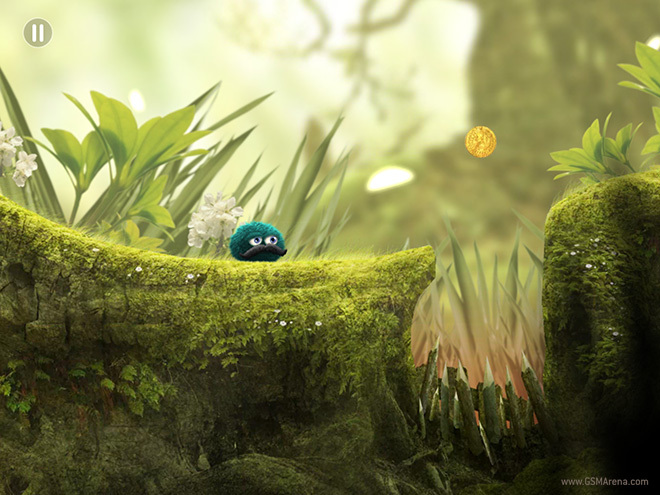 The game follows the story of Leopold, the green furball with the luxurious mustache you see in the image above, as he follows the trail of his stolen treasure and tries to get it back. Read on for the full review of the game. 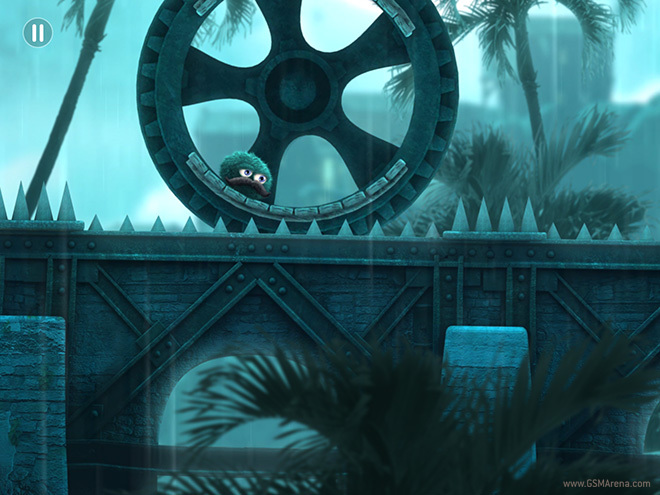 Leo’s Fortune is a 2D side-scrolling platforming game. You control Leopold, or Leo, by the controls on the left side of the screen. You can make him jump up and down by the controls on the right side of the screen. You can press and hold the jump button, which makes Leo expand and float in the air while slowly descending. This is useful to extend your jump, pressing switches or when you want to stop him falling down a hole by enlarging him. 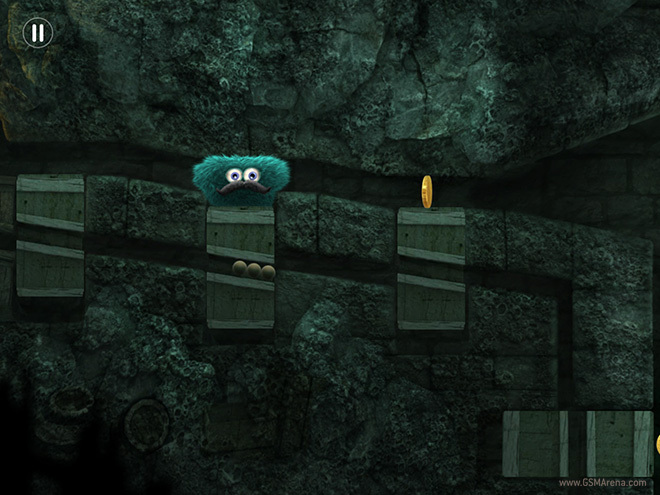 Most of the gameplay involves jumping from one platform to another, collecting coins and avoiding traps. Often, you will also have to solve a puzzle to open a door and progress in the game. 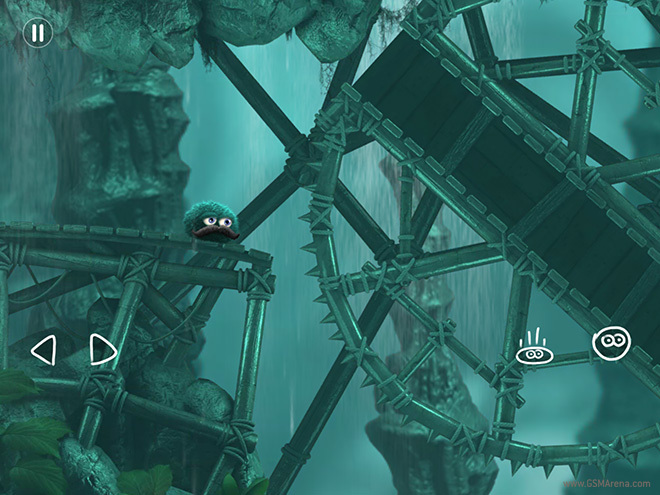 There are twenty levels in total in the game and each level has three optional objectives. One is to collect all the coins, second is to complete without dying and third is to complete it within a certain amount of time. Accordingly, you get one, two or three stars for the level. 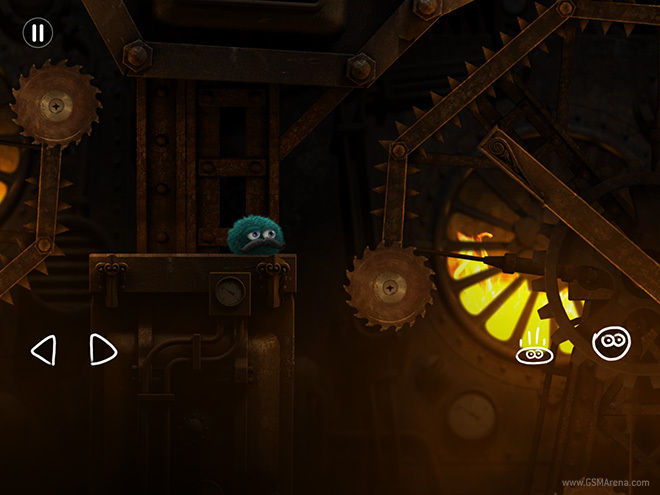 Other than that, there are also some gears scattered through some of the levels that you have to find and collect. Collecting the coins is the easiest part. They are right in your path and impossible to miss. Finishing the level without dying is quite difficult, however, as is finishing it under the specified time. The platforming sections in the game are quite tricky. More than skill, you need patience so you can wait and time your jump perfectly. A poorly timed jump almost always ends in Leo falling to his death. The puzzle sections were quite fun. Usually they involved moving some crates around to push a switch or weight down a platform. None of them are particularly difficult but they are fun to do nonetheless. The overall gameplay relies a lot on quick movements, which is where I found the controls lacking. By default, you slide left and right on the left part of the display to move Leo and up and down on the right side to make him jump up and down, respectively. This does not work very well and often the controls don’t respond when you want to or you find yourself moving your thumb out of the screen and on to the bezel on the iPad. 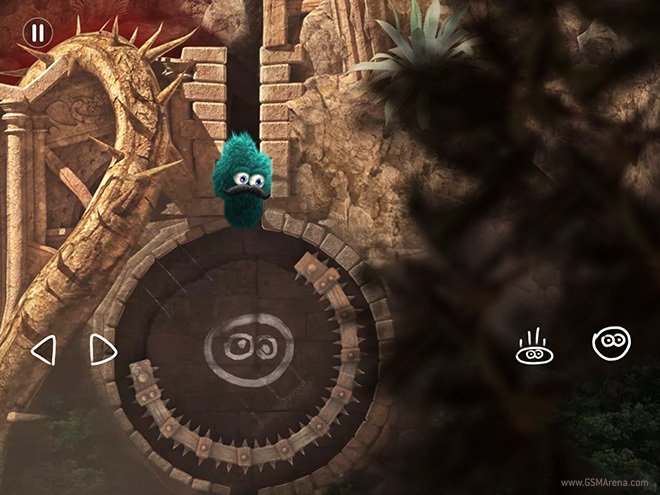 Thankfully, the game offers you to switch to fixed buttons on the screen, which is the ideal way to play the game, but while the movement controls have a wide touch area the jumping controls are more precise and thus you have to tap precisely on the buttons to jump, not so easy when you are looking at the character above and not at the buttons themselves. Hitting the buttons is one thing but the character movements are a bit sluggish. Leo’s movements aren’t as twitchy as you usually expect from characters in these games and he carries a certain amount of inertia, which makes quick movements difficult. Often you end up dying a ridiculous number of times because you just can’t get him to move as quickly as you’d want him to. I also couldn’t figure out the jumping till the end. Sometimes he’d jump nice and long and sometimes, especially when you have to make a critical jump he’d fall frustratingly short, making you jump several times, not knowing what you’re doing wrong, till you get him on the platform. The frustration with the controls weren’t as significant as it might seem and overall I found myself enjoying the game. The platforming sections were fun and challenging. The puzzles were simple but engaging. And although there aren’t a lot of levels here, you’ll end up playing them again and again if you want all the stars and gears in the game. Leo’s Fortune is a beautifully designed game. Everything, from the backgrounds to the platforms and the traps are all well crafted. The characters are also well depicted and you wish you had a mustache as lush as Leopold’s. I wish he had more facial expressions, though, as that is something a lot of games do these days. Having the character respond to little things around him just adds a bit more depth to it. The biggest crime the game does, however, is that the game is non-Retina. I hope the developers have a good excuse to release a game on iOS in 2014 without Retina graphics. Right off the bat you can see that the game is not running at the screen’s native resolution. This was a tactic used by some games in the past because the iPad 3 hardware was not powerful enough to run 3D games at native resolution. But we have a come a long way since then in terms of hardware capability and this is not even a 3D game. Why, then, such a beautiful game is relegated to non-native resolution is beyond me. In terms of sound, Leo’s Fortune does a fantastic job, with a stunning soundtrack for all the levels. Even the sound effects are great, along with the voice for Leopold. You can also hear him occasionally commenting on his surroundings and be rather pleased with himself when he traverses a rather complicated series of traps. Leo’s Fortune didn’t turn out to be perfect game I was led to believe. The controls aren’t as precise as I’d like them to be and the lack of Retina graphics is just inexcusable. However, it is still an entertaining game, with fun and challenging levels that should keep you busy for a while. The graphics, despite the resolution, still are beautiful and the music is excellent. At $5, the game is well worth the price. Hopefully, the developers fix the issues in future updates. Note: The game was reviewed on an iPad Air.